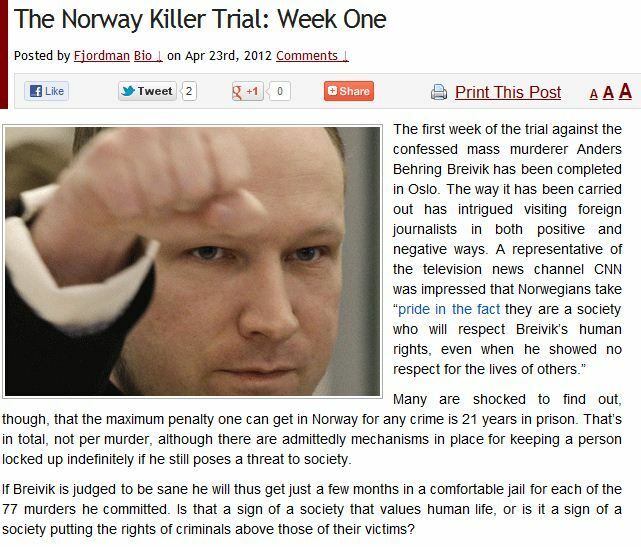 FJORDMAN AT FRONT PAGE MAGAZINE ON BREIVIK TRIAL……. – The Tundra Tabloids……. FJORDMAN AT FRONT PAGE MAGAZINE ON BREIVIK TRIAL……. I finished reading his manifesto a week before the trial began. I was struck by how much he has quoted the free online encyclopedia Wikipedia, and how little focus on this there has been in the mass media — as opposed to the fact that he cites some Islam-critical writers. Previous Post Previous Post ANOTHER DISASTER OF MAJOR PROPORTIONS JUST WAITING TO HAPPEN……..
Next Post Next Post NAACP BOOTS REPUBLICAN ALLEN WEST FROM ORGANIZATION FOR CALLING MARXIST DEMS, MARXIST DEMS……..